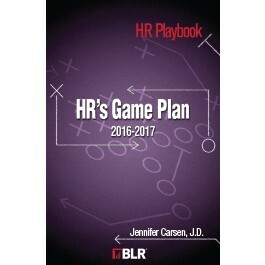 Prefer to download HR Playbook: HR's Game Plan? Download here. New regulations from the FLSA and their significant impact on organizations. The upsurge in workplace violence and the need for prevention and safety. A constantly evolving workplace when it comes to diversity and the important need for HR to gracefully such challenges. A focus by the EEOC on contingent workers of all types, including contractors, interns, temporary workers, and so on. The Affordable Care Act’s wide impact on many aspects of HR and business in general. Big data on everything from hiring strategies to retention predictions. A shortage of talent and low unemployment rates have created a burden for many HR professionals and recruiters when it comes to hiring qualified workers. Jennifer Carsen is an HR writer, consultant, and former employment lawyer who regularly writes for BLR’s California Employer Daily (which currently has over 30,000 subscribers), HR Decisions magazine, and other BLR publications. She is also the author of HR How-to: Employee Retention (CCH, 2005) and has been quoted as an employment law expert in the Chicago Tribune. She regularly advises businesses on employment law compliance, employee retention and engagement, hiring, interviewing, and effective leadership. In 2012, she was named a “Top 25 Online Influencer in Employment Law” by HR Examiner. A former member of the labor and employment group at Sidley Austin LLP, Carsen is an alum of Williams College and the NYU School of Law, as well as a member of the New Hampshire Bar Association. She lives in Portsmouth, New Hampshire.